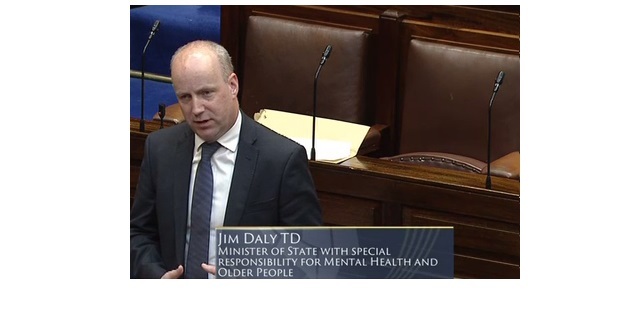 Minister Jim Daly has said that the government is taking on rural Ireland’s problems ‘’one by one; be they criminal or be they infrastructural’’. He said; ‘’We are listening, and we are acting on your advices’’. 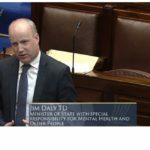 The Minister cited funding from two different schemes as proof of ‘’Fine Gael’ holistic approach to rural issues’’. He said; ‘’Last week alone we provided funding for community text alert schemes to help prevent crime in West Cork and for the sort of infrastructural development that proves again West Cork is one of the real seven wonders of the world. The Minister was referring to the decision in government that community groups working to prevent crime in West Cork can now apply for funding under the 2018 Text Alert Rebate Scheme. Mr Daly said; ‘’this new fund of €150,000 for Text Alert will help community groups working to prevent crime across West Cork. Criminals will now know there are eyes everywhere watching them’’. The Minister noted that; ‘’last week we made a key investment in the sort of infrastructure that diverts people from crime with a €70,000 investment in West Cork Outdoor Trails and Cycleways. Community groups from Clonakilty to Goleen to the Seven Heads Peninsula are being provided with the opportunity to turn their plans into real bricks and mortar’’. Concluding Minister Daly said, “This is not just building an asset for tourism. It is about opening out the resources and beauty of our country-side for our own people’’.